Precise, Inc. Supports Criminal Justice Reform Non-Profit with Video Production - Precise, Inc.
Video production is an integral part of modern litigation, one in which Jaime Muth, a videographer for Precise for the past ten years, is very familiar. Recently, she relied on her expertise to produce a video project in the legal space, but not in the form of a deposition, settlement video or day-in-the-life video. Precise Videography Manager Jaime Muth and Certified Medical Illustrator Philip Ashley at the Pennsylvania Innocence Project’s Annual gala. At the request of the Pennsylvania Innocence Project, an organization that strives to exonerate individuals convicted of crimes they did not commit, Muth produced a video to highlight the stories of three wrongfully incarcerated people freed through the work of the Innocence Project. The video played during the awards ceremony of the Innocent Project’s 9th Anniversary Celebration at WHYY Studios on May 9th. The annual program honors individuals who have dedicated their time and expertise to criminal justice reform. This is the second year in a row that Muth created a video for the Innocent Project’s event. 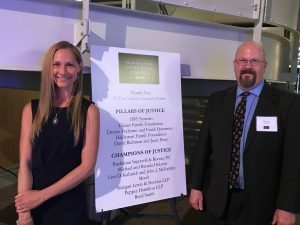 “The Innocence Project wanted to give the gala attendees a clear picture of what their organization can accomplish, and I knew I could do that,” said Muth. The time allotted for the video playback at the event was fairly short, so Muth narrowed down over 90 minutes of raw interview footage to 10 minutes, utilizing her editing skills to capture the details critical to conveying the individuals’ stories authentically.